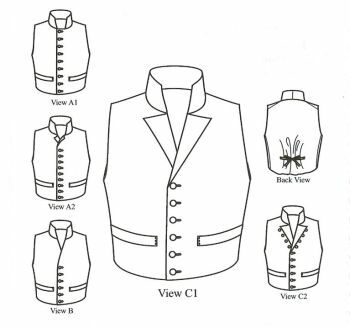 KK4202 - 1790 - 1850 Single-Breasted Man's Waistcoats (Vests) Pattern. Includes Chest Sizes 34 through 52 in this one pattern. 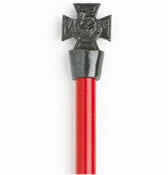 Includes patterns and directions for five views and either a single or double layer back option. Worn by Both Common Working Men and Fashionable Men circa 1790-1815. Included are historical notes and references, in addition to era correct sewing techniques. Excellent for War of 1812, Regency, Pride and Prejudice, Sense and Sensibility Era. Authentic, Documented Historic Clothing Patterns for the Living History, Museum and Theatrical Costumer. Regency Period, Sense and Sensibility, Pride and Prejudice, Jane Austen Era, Beau Brummell Era, Elizabeth Bennett Costume, Jane Eyre Costume, Napoleanic Costume, Regency Era Living History Costume, Mr. Darcy Costume, Great for Jane Austen or Sense and Sensibility, Jane Eyre, and Pride Prejudice impressions. Fashion in the period 1795�1820 in European and European-influenced countries saw the final triumph of undress or informal styles over the brocades, lace, periwig, and powder of the earlier eighteenth century. In the aftermath of the French Revolution, no one in France wanted to appear to be an aristocrat, while in Britain, Beau Brummell introduced trousers, perfect tailoring, and unadorned, immaculate linen as the ideals of men's fashion. Women's fashions followed classical ideals, and tightly laced corsets were temporarily abandoned in favor of a high-waisted, natural figure In this period, fashionable women's clothing styles were based on the Empire silhouette � dresses were closely fitted to the torso just under the bust, falling loosely below. In different contents, such styles are commonly called "Directoire" (referring to the Directory which ran France during the second half of the 1790s), "Empire" (referring to Napoleon's 1804�1814/1815 empire, and often also to his 1800�1804 "consulate"), or "Regency" (most precisely referring to the 1811�1820 period of George IV's formal regency, but often loosely used to refer to various periods between the 18th century and the Victorian). These 1795�1820 fashions were quite different from the styles prevalent during most of the 18th century and the rest of the 19th century, when women's clothes were generally tight against the torso from the natural waist upwards, and heavily full-skirted below (often inflated by means of hoop-skirts, crinolines, panniers, bustles, etc.). The high waistline of 1795�1820 styles took attention away from the natural waist, so that there was then no point to the tight "wasp-waist" corseting often considered fashionable during other periods. Inspired by neoclassical tastes, the short-waisted dresses sported soft, flowing skirts and were often made of white, almost transparent muslin, which was easily washed and draped loosely like the garments on Greek and Roman statues. Thus during the 1795�1820 period, it was often possible for middle- and upper-class women to wear clothes that were not very confining or cumbersome, and still be considered decently and fashionably dressed. Among middle- and upper-class women there was a somewhat basic distinction between "morning dress" (worn at home in the afternoons as well as mornings) and evening attire � generally, both men and women changed clothes in preparation for the evening meal and possible entertainments to follow. There were also further gradations such as afternoon dress, walking dress, riding habits, travelling dress, dinner dress, etc.